Google pictures of hay and straw and you’ll surely be confused about which one is hay and which one is straw. Both look similar so it’s easy to incorrectly interchange them. Despite their resemblance, they are actually very different from each other. This article will discuss the difference between hay and straw. Hay is made from dried plant stalks collected from green legumes and grass. The plants are cut before maturity and then dried. Because of this, hay has a greenish hue and may still have flowers and seeds attached to the stalks. Hay bales may contain a high level of moisture inside because the plants are still alive when cut. If hay contains this moisture, it may cause mold growth and also speed the hay’s rapid decomposition. When hay starts to decompose, heat is generated on the inside of the bale, which may cause combustion. During the winter when there is no fresh grass available, farmers use hay as livestock feed. Generally, it provides the necessary fiber and sugar to animals but the specific kind and amount of nutrients available in the hay are largely dependent on the plants collected to make hay. It is relatively easy to make hay as long as you have enough grass on your property. Aside from being used as livestock feed, hay is also a good fertilizer. When allowed to decompose on the ground, it transfers its nutrients and minerals to the soil. It can also be used as bedding for gardens to avoid soil erosion during heavy rains. Additionally, many gardeners use hay to get rid of weeds by covering the ground with a dense layer of hay. Straw is made from the leftover stalks from a range of grain crops like barley, oats, rye, and wheat. Once the seed heads are harvested, the hollow stalks are left and dried. Straw has a golden yellow color because it is very dry. Because of its hollow stems and low moisture content, straw is a good insulator. It is used as wall insulation in some homes and can even be used to build a house – a straw house. Straw is also light and fluffy, which is perfect for animal bedding. Gardeners use straw as ground bedding to naturally prevent the growth of weeds. It is not, however, used as livestock feed because it only contains a minimal amount of nutrients and minerals. Straw is very versatile and can also be used in non-farm products like hats, baskets, packaging and paper. What, then, is the difference between hay and straw? Hay is made from dried plants like legumes and grass, whereas straw is made from leftover stalks of grain crops. Both are dried, but hay may sometimes be green while straw is golden yellow. 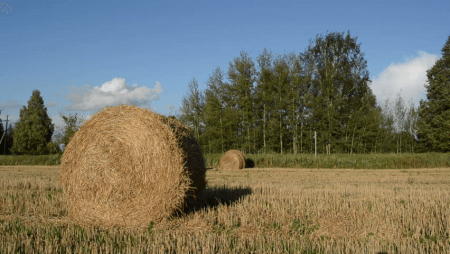 Hay is dense and can contain a high level of moisture, while straw has low moisture content and is light and fluffy. Hay is not as versatile as straw. 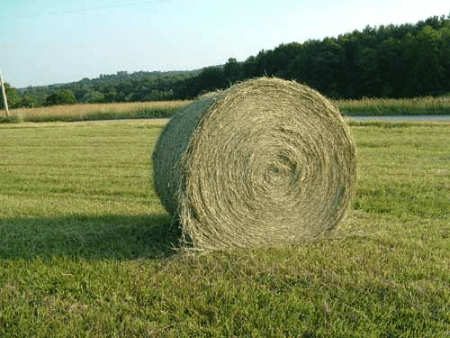 Hay is primarily used as livestock feed because it contains nutrients. It is also used as ground bedding to prevent weeds and as fertilizer when it decomposes. Straw does not have nutrients so it is not fed to animals. It is, however, used as an insulator, animal bedding, ground bedding for plants, and as a raw material to make hats, baskets, packaging and paper. Moreover, small-scale gardeners can make hay as long as there is enough grass to cut on their property. On the other hand, it is difficult to make straw because you will need grain crops which are not readily available in residential gardens.